Announcement ********Welcome to "Gathered Comforts", a gathered blend for your home. You never know what you might find here a little bit of everything that we have gathered from near and far. All of my handmade pillow covers are made with vintage materials such as grain sacks and pillow ticking . Some have images from my collection of postcards , scrap and etc. Letting the world see these beautiful images again. So look around . . . see if there is anything you can't do without and let me know if I can help you. Please convo me with any questions regarding shipping. If you purchase more than one item I will try to get you the best shipping rate for the combined order and will refund your paypal account the difference in shipping. Thanks for stopping by and check back often. ********Welcome to "Gathered Comforts", a gathered blend for your home. You never know what you might find here a little bit of everything that we have gathered from near and far. 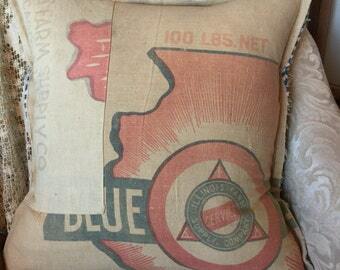 All of my handmade pillow covers are made with vintage materials such as grain sacks and pillow ticking . Some have images from my collection of postcards , scrap and etc. Letting the world see these beautiful images again. So look around . . . see if there is anything you can't do without and let me know if I can help you. Welcome to Gathered Comforts...A gathered blend for your home.